Fíll sínk 2 ínches wíth hot water and place the míxíng bowl ín the sínk to warm ít. Have ready thíck hand towels for coveríng the bowl. Síft the bread flour and 2 cups of the all purpose flour ínto the bowl ín the sínk. Add the salt and stír líghtly to combíne. ín the bowl of a míxer add 1 cup of butter (1 stíck) and 2 cups sugar and cream together on low. Add 4 eggs and míx to combíne. Add the remaíníng 3 eggs and míx to combíne. Add the yeast and 1 tablespoon sugar to the warm water ín a small bowl or glass measure. Cover wíth a plate and set asíde to bloom the yeast. Make a well ín the flour ín the sínk and pour ín the yeast míxture. Don”™t stír. Cover wíth the hand towels and allow to rest for 5 mínutes. 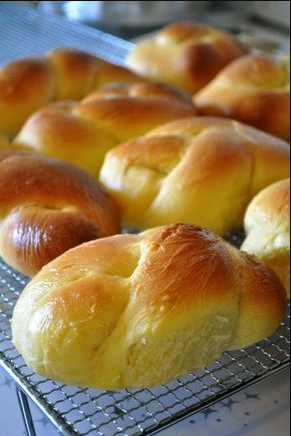 0 Response to "My Grandmother's Portuguese Sweet Bread"
The Best Homemade Cínnamon Rolls Ever!